If you don’t regularly wash your car, dirt builds up and ultimately fine grain dirt gets rubbed into the paintwork causing damage. The longer you leave it the worse it gets. On occasion, the car needs a deep polish to really remove dirt, marks and fine scratches, then a good wax to nourish and protect. Then the car gleams as it should, and looks new for much much longer. Your skin is exactly the same – a great maintenance routine will keep your skin looking good. The key is to start with a simple daily routine, then add some weekly additions that are more intensive to really see results. It’s essential to clean your skin morning and night. I use Sodashi’s Clean Skin Cleanser then moisturise. I use Sodashi’s Sleek Moisturiser. I don’t close shave but I use clippers. This means I need to rely on Sodashi to remove the dead skin build up that shaving otherwise would. So a couple of times a week I use Sodashi’s Rejuvenating Concentrate with really hot water – it feels like going to the barber! 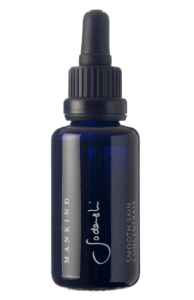 It’s a blend of therapeutic plant oils that exfoliate and nourish the skin. Also, I aim to use the Rejuvenating Serum a couple of times a week. This is a power packed oil that really makes your skin feel like new. Importantly, I like to avoid putting anything on my skin that I couldn’t eat. Anything you apply to the skin goes straight into the system, so for me my skincare has to be 100% natural. My travel essentials include the Rejuvenating Serum and Sleek Moisturiser. When I board a flight I apply the serum and layer the moisturiser on top. I come off the plane looking fresh rather than like the life’s been sucked out of me! Whenever possible I like to fit in sport when I travel, including skiing, hiking and a range of water sports – again, extra moisturising is key. Great skin takes more than just great skincare though; you have to take a holistic approach. I drink lots of water. Once you get into the habit of drinking two litres a day you see your skin become clearer. I also meditate twice a day and eat as well as possible, trying to make meals start big and taper off through the day. Maintaining a good diet is the hardest challenge for me. Generally keeping active is also important for me, preferably with outdoors activities like windsurfing, sailing, skiing and stand-up paddle boarding.